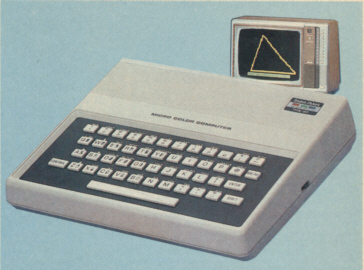 TRS-80 Micro Color Computer Model MC-10. The easy and affordable way to join the “computer revolution”! Just attach the MC-10 to any television and you’re all set. Learn to write your own programs with color and sound using our excellent tutorial manual (included). Or use programs from our growing library of ready-to-run MC-10 cassette software for entertainment or education. Produce graphics characters with just two keystrokes. Enter BASIC commands using multi-purpose keys. The MC-10 features a standard typewriter-style keyboard — not a flat, plastic overlay. Displays 16 lines of 32 upper case characters with reverse video capability. The MC-10 has a cassette port that lets you use an optional cassette recorder to save and load programs and data, and an RS-232C serial interface to connect a printer or modem. Write larger, more complex programs on your MC-10. Slip the 16K RAM Module into the slot located on the back of the computer for an additional 16,000 characters of program and data space — 20,000 characters total. Microprocessor: 6803 8-bit. Keyboard: 47-key typewriter style, with Break, Control and 16 graphics keys. Multifunction keys for BASIC commands. Video Display: 16 lines of 32 upper case characters. Output connects to any standard TV set (300 ohms) and includes video and sound. Memory: 4K RAM, expandable to 20K. Input/Output: 1500-baud cassette (recorder optional). RS-232C serial I/O port. Dimensions: 2x7x8½". Weight: 29½ ounces. Power: 120 VAC, 60 Hz, 16W.